Tutorial Fellow at Lady Margaret Hall in the University of Oxford. EPSRC Early Career Fellow January 2016 to December 2020. Department of Statistics: Room 3.08. Lady Margaret Hall: Ground floor back office, 2 Fyfield Road. My research interests are in probability and combinatorics. Published papers and preprints. I am an associate editor for Electronic Journal of Probability and a member of the editorial board for the London Mathematical Society Student Texts book series. Slides for my 4-hour minicourse Around the Brownian continuum random tree at the Easter Probability Meeting, Sheffield 2018. Notes and slides for my minicourse Scaling limits of random trees and random graphs at the PIMS-CRM Summer School in Probability 2017. A (reasonably non-technical) account I wrote of some recent work on minimum spanning trees. Click on + to expand. I wrote my Ph.D. thesis on various aspects of the structure of random hypergraphs, with particular emphasis on the use of stochastic process methods. I have worked extensively on processes of coagulation (or coalescence) and fragmentation. More recently, I have been working on scaling limits for random trees and graphs. B.A. and M.Math. in Mathematics at New Hall (now Murray Edwards College), University of Cambridge. Ph.D. in the Statistical Laboratory, University of Cambridge, with James Norris. 2003-4: Postdoc in the Laboratoire de Probabilités et Modèles Aléatoires at Université Paris VI with Jean Bertoin. 2004-7: Stokes Fellow in Mathematics at Pembroke College, Cambridge. 2007-9: EPSRC Postdoctoral Fellowship in the Department of Statistics at the University of Oxford. 2009-11: Assistant Professor in the Department of Statistics at the University of Warwick. 2011-2017: Associate Professor in the Department of Statistics and Tutorial Fellow in Statistics at Lady Margaret Hall, University of Oxford. February 2014: Professeur invité at Univeristé Paris-Dauphine. November 2016, November 2017: Professeur invité at École polytechnique. Slides from my plenary lecture at SPA in Oaxaca, 19th-24th July 2011. Slides from my IMS Medallion lecture at the World Congress in Toronto, 10th-15th July 2016. Slides from my plenary talk at the German Probability and Statistics Days in Freiburg, 27th February-2nd March 2018. 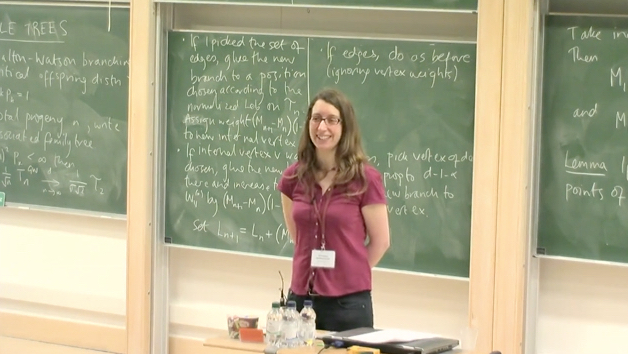 Slides from four lectures on random trees, random graphs and fragmentation processes given at Warwick in April 2009: Lecture 1, Lecture 2, Lecture 3, Lecture 4. Slides and the handout from a lecture course given at the Young European Probabilists' Workshop on Probability, Random Trees and Algorithms, EURANDOM, 8th-12th March 2010. Slides from two lectures at the Dutch Stochastics Meeting in Lunteren, 12th-14th November 2012. Slides from a minicourse given at the ALEA in Europe Meeting, LMU Munich, 22nd-26th February 2016. Slides and exercise sheet from a minicourse given at the VIII Escuela de Probabilidad y Procesos Estocásticos, CIMAT, Guanajuato, Mexico, 12th-16th September 2016. My Part III (approximately masters-level) essay entitled The Chen-Stein Method for Convergence of Distributions [.ps.gz (120kb)]. My PhD thesis entitled Large Random Hypergraphs [.ps.gz (747kb)]. In Oxford, I have given tutorials on Prelims Probability, Prelims Statistics, Prelims Optimisation, Part A Probability, Part A Statistics and Part A Graph Theory to the LMH students. In Cambridge in the distant past, I supervised Part IA Probability (for both Maths and CS students), Part IB Markov Chains and Part II Probability and Measure. I have supervised Part C projects for Mathematics and Statistics students and masters dissertations for the MSc in Applied Statistics. Eleonora Kreačić, DPhil student 2013-17, jointly supervised with James Martin), now a Quantitative Researcher at JP Morgan Chase & Co.
Dominic Yeo, DPhil student 2012-16 (jointly supervised with James Martin), now a postdoc at the Technion, Haifa. Sanchayan Sen, postdoc April-August 2016, now Associate Professor at the Indian Institute of Science. Simon Griffiths, postdoc 2013-16, now faculty at PUC Rio de Janeiro. Benjamin Scellier, École polytechnique, stage de M1 (2013), now PhD student with Yoshua Bengio at Université de Montréal. Delphin Sénizergues, École normale supérieure (Paris), stage de M2 (2015), now PhD student with Nicolas Curien and Bénédicte Haas at Paris 13. Guillaume Conchon-Kerjan, École normale supérieure (Paris), stage de M2 (2016), now PhD student with Justin Salez at Paris 7. Louigi Addario-Berry, Marie Albenque, Anne-Laure Basdevant, Jean Bertoin, Nicolas Broutin, Daphné Dieuleveut, Rui Dong, Simon Griffiths, Bénédicte Haas, Olly Johnson, Eleonora Kreačić, Grégory Miermont, James Martin, James Norris, Michał Przykucki, Alex Scott, Delphin Sénizergues, Dario Spanò, Daniel Ueltschi, Peter Windridge. Some mathematical links and some non-mathematical links. Last modified: 13th February 2019.